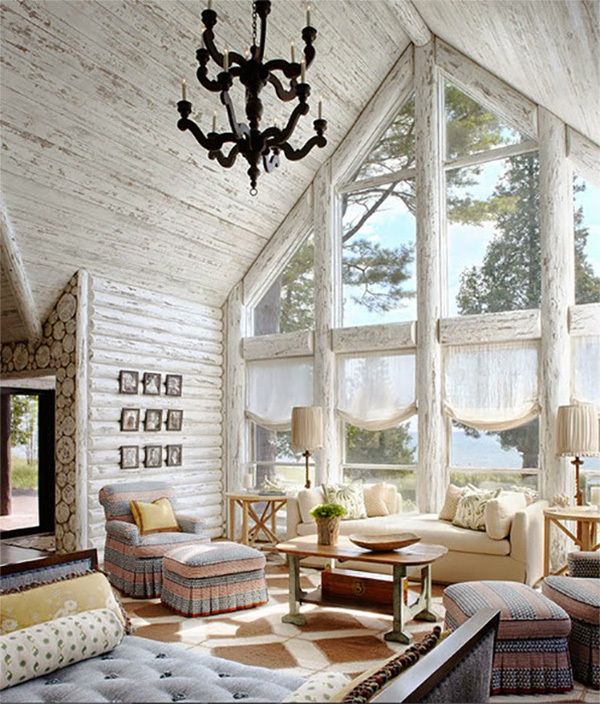 All of this cold weather has me thinking of cottages, cabins, and cozy winter homes! I don’t have a winter cottage to retreat to yet, but these beautiful homes certainly are an inspiration. Take a look at these cozy and relaxed home designs. 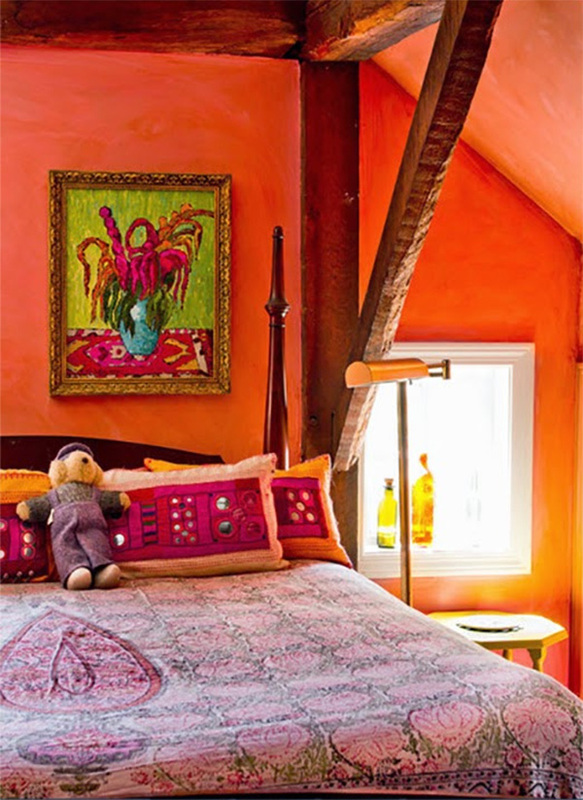 Nothing warms up the winter like a warm orange shade in a space. Such a cheerful cabin bedroom for a little girl, complete with the signature wood beams one comes to expect when staying at a rustic cabin. 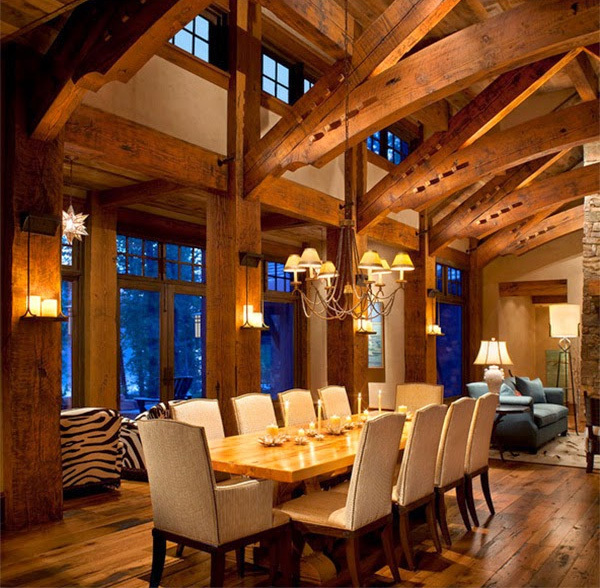 Ceiling beams are one of the most distinct features of great cabins. Many of the rooms featured here have definitely capitalized on the grand feeling ceiling beams add to a room. The richness and scale of the ceiling beams above really ground the large room and lift your eyes toward the rustic chandelier. I’d love to throw a dinner party for 10 fabulous friends at a cabin like this one (above). 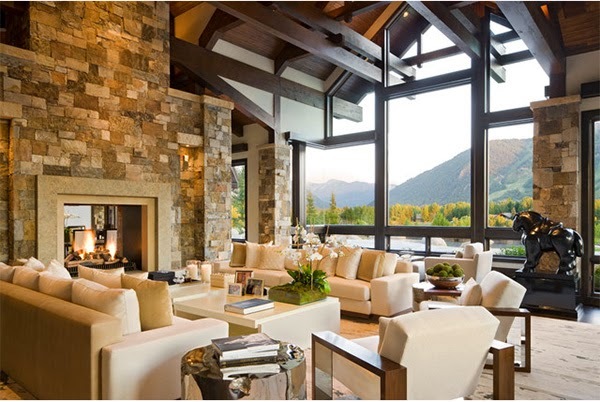 It’s rustic, yet elegant, a perfect combination especially in the winter time. And you can’t beat the warm, candle mood lighting. If the focal point of your room is a fireplace, then best to go all out with a unique and attractive mantel like the lovely, blue and white tile fireplace above. Oh, and the fire is lit already, just in time for someone to cozy up with good book! When stuck in dreary winter time weather, make sure your living quarters are nice and bright. These two rooms (above, below) really show the impact color has on adding brightness to a room. 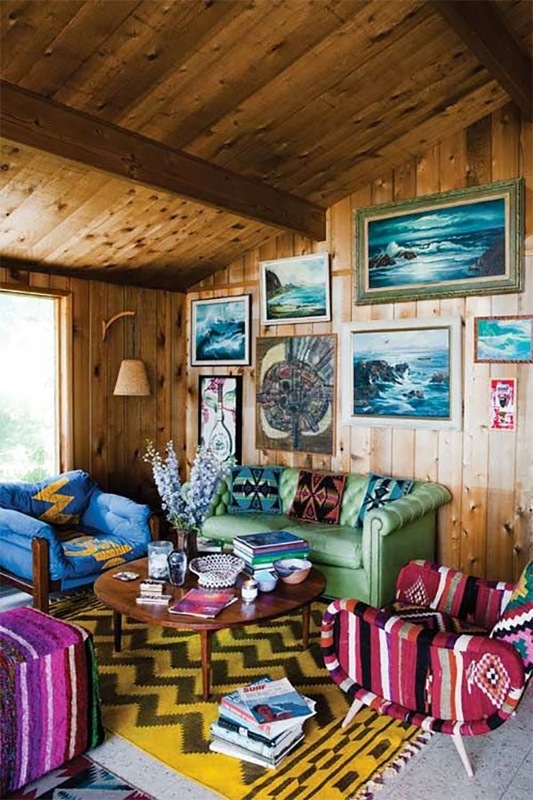 Generally, when in a space with a lot of wood paneling, the room may have a dark feel to it, but with the burst of bright yellow, purple and blue (above), this space is anything but dark. In this all white bedroom, the cabin still has wood paneling, but painting them white gives the space the bright and welcoming look we want when stuck indoors during the winter. And not to forget these stunning turquoise doors (above) that let plenty of light into the bedroom! 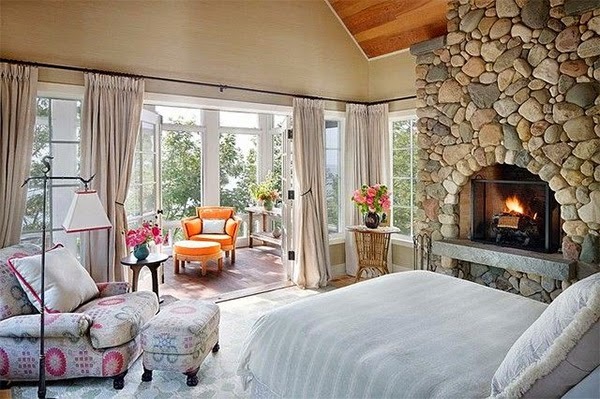 The cottage below features one of my favorite bedrooms complete with a fireplace, fantastic upholstered orange armchair, and attached sun room. Stonework can be overwhelming in some spaces, but this cottage strikes the perfect balance between rustic and feminine. A well styled bedroom, indeed. If you’re interested in seeing more rustic-meets-chic interior design, then re-visit my post Chic meets Rustic: Decorating with Reclaimed Wood. Thank you for your support, blog comments, and pleasant exchanges in 2014. Looking forward to hearing more from you wonderful readers in 2015! P.S. I’m linking up with other great bloggers this week here.